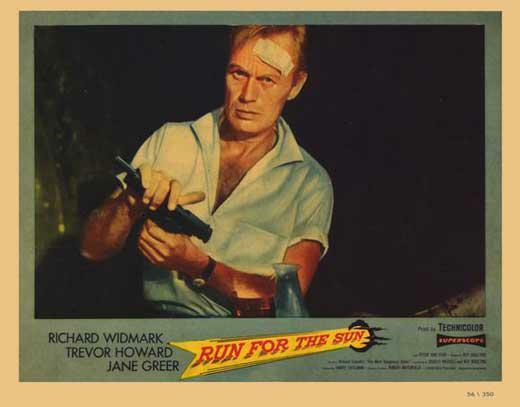 Here’s a compact thriller with a sparse cast but one that features a foursome most classic film fans are sure to find comfort in led by Richard Widmark in one of his cynical good guy roles as opposed to his “let’s throw the old lady down the stairs” bad guy roles. Sorry Richard but as you yourself have said, you’ll never live that one down. This adventure is from director Roy Boulting who also wrote the screen play in this 1950’s updating of The Most Dangerous Game. For the uninitiated the plot of Game is when a hunter tracks the most dangerous of all predators, man, through the jungle wilderness. Jane Greer’s big city magazine writer is in the jungles of Central America tracking the whereabouts of famed writer who has taken a hiatus from the world after a disappointing novel. She’ll soon find Widmark boozing away his writing talents, spending his days fishing and nights in a dive bar cantina. She plays coy as to his true identity but he sees through the put upon act of Greer, easily the most beautiful woman Widmark’s seen in these jungle parts. Maybe she can help him get over the woman he’s been drowning his sorrows in a bottle over. Maybe she might even ignite the hunger to write again. Maybe. But she’s there for a story and he doesn’t yet know it. When she begins to feel like a first class heel and developes some motherly instincts as far as Widmark is concerned she decides to abandon the story and fly back to civilization in Mexico city. Widmark being kind of fond of Miss Greer by this point in our 99 minute story volunteers to fly her there in his two seater. And so begins the real story of Run For the Sun. When a mishap with Widmark’s compass puts the pair way off course in unchartered territory, the plane runs out of gas forcing an emergency landing that leaves both of them tossed about and Widmark suffering from a nasty bang to the head. Fortunately for the pair, they’ve come to rest near a jungle estate where Trevor Howard and Peter Van Eyck appear to be on site for archaeology research into the Mayan civilization. Or are they? There’s an air of mystery about the pair and Widmark is getting nosy. When the wreckage of Widmark’s plane disappears and his six shooter goes missing, he knows something isn’t quite right with their less than gracious hosts. There’s something about Howard that he just can’t place and seeing him with the German Van Eyck seems an odd coupling. But therein lies part of the clue to the mystery he can’t help but solve as he and Howard go through a game of cat and mouse. For the four leads this is going to become a very physical film because as you might have already figured out in the opening comments above, Howard and Van Eyck are going to be hunting Widmark and Greer through jungles and swamps. Full marks to the foursome for getting right into the thick of things and diving into some nasty swamps as the chase moves on to the final showdown. I’d also like to point out that as unlikely as it may seem, the script does allow for Widmark and Greer to find enough strength for a love scene while just seconds earlier they appeared to be near exhaustion. This after the pair come to realize that an earlier spat was over nothing and they’ll be together till death do them part. Which may be much quicker than they’d like of Howard and Van Eyck get them cornered. A good role here for Widmark who had a knack for moving back and forth between heroes and villains. 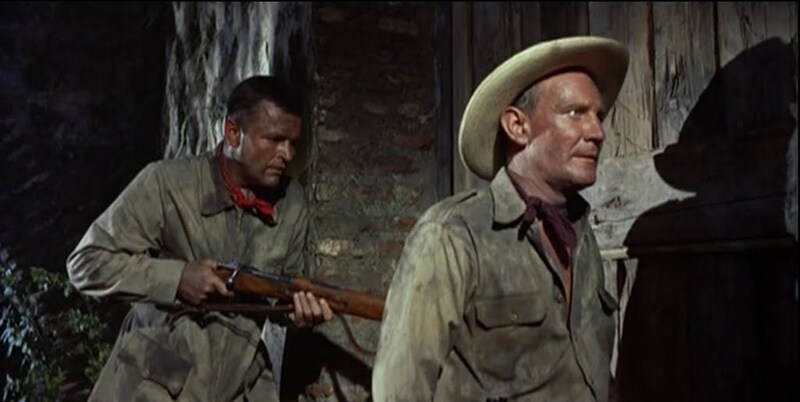 But even his heroes are usually flawed and find circumstances forced upon them like he does here and in films like the outstanding western The Last Wagon. Greer had left an indelible mark in Noir by this time in Out of the Past and following this feature would work mainly in television for the balance of her career. 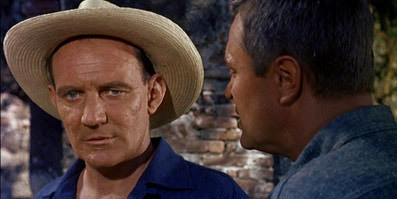 Trevor Howard would carry on moving between leading parts and character roles with the character parts taking precedent as the years would pass. Easily one of my favorite actors from England. A real scene stealer as he played opposite many of the biggest stars in film during his lengthy career. Van Eyck was an easy actor to recognize though his name may not come as easily to many but his knack at playing unsavory characters remains in one’s memory. If I can point out one film aside from his more well known titles like Wages of Fear, I’d recommend a nifty thriller from Hammer Studios in 1958 titled The Snorkel. Looking to find this entertaining adventure Run For the Sun? You may find it turn up on TCM or better yet, you can order it as I did though the MGM Limited Collection on DVD for the made-on-demand market. But seriously, who comes up with these rather drab covers? That is a rotten cover, offering no clue to the color or tension of the movie. Anyway, a good movie and you focus on the main attractions. Widmark could barely put a foot wrong at this stage, and rarely did so at any point, and was one of those few actors who were wholly convincing as either hero or villain. Greer was fine too and she and Widmark are a nice-looking lead couple. The story is updated and changed round a fair bit but works well and the film looks terrific. Yes this is prime Widmark and he’s always been one of those actors I love to revisit. His work in the 1950’s offers plenty of varying titles and genres. He’s another reason I usually point to the 50’s as my favorite decade of movies if I had to narrow it down to a 10 year segment. Wages Of Fear is a tension filled classic . 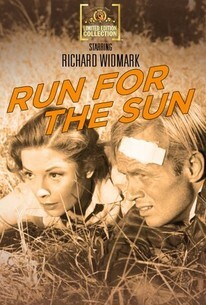 I’ve always been a Widmark fan and this a good one from his prime leading man years. Enjoy The Snorkel. I’m looking forward to revisiting it since picking it up on blu ray. Enjoyed your review and great illustrations . Love watching this entertaining thriller. Actually, I dont mind the DVD cover! Nice closeup of Jane and Richard, though I agree it doesn’t convey much about the plot. DVD I have has a different cover under heading “Boulting Brothers, The Collection”, with a shot of Richard dragging Jane through jungle.